Great product for those who wear clogs. It is difficult to find thse half socks and since I wear them throughout the year, I always need replacements. I wear these with tennis shoes, slides, wedges, and heels that cover the top of my feet. They stay in place and don't bunch up. They really save the toes and help with foot sweat on hot days. I love these socks. They are great. Toe socks are hard to find. I was happy to find them here. I have been looking for something like this for quite a while. I ordered 1 package to try and like it so much that I'm ordering 2 more packages. I looked all over for these toe socks. All I could find were ones made of nylon. I needed these to wear with backless shoes because of heel surgery I had in Jan. These were exactly what I was looking for and needed! I wear them with my shoes for comfort and fit. I would recommend them to anyone who wears the backless or mule shoe. Keeps the front of your foot dry and comfortable in clogs or mules, -- stop foot from sweating Second time ordered love then. What I need in our colder weather or any time my toes get cold. Couldn't find these anywhere locally so it was great to find a catalog that carries them at such a reasonable price! The toe socks are just right for anytime. 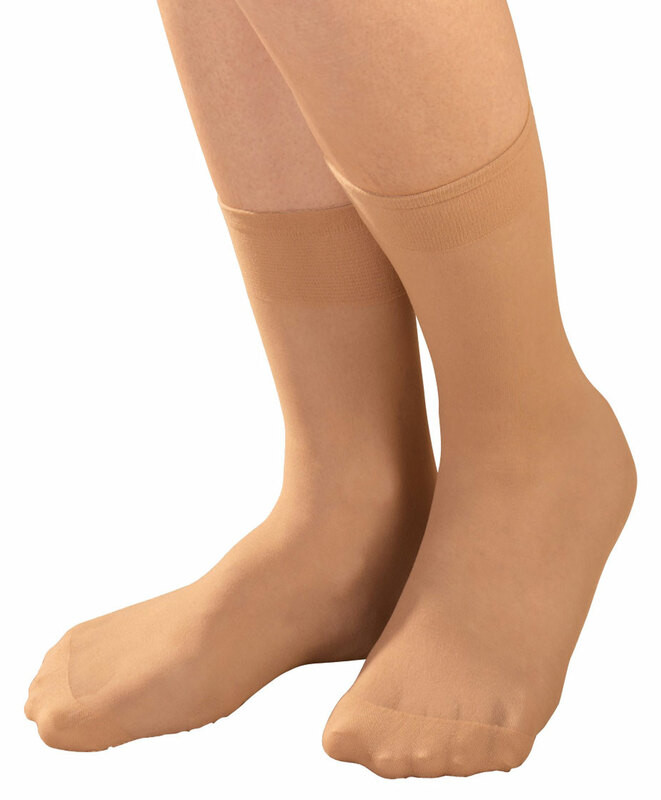 I wear toeless support hose and the socks are what I needed in my shoes. These little socks are durable, wash and dry easily, stay in place when being worn with clogs, athletic clogs and backless shoe of any type. They cushion and protect the toes and the balls of the feet. Wish I had ordered them a long time ago. ~USE THEM WITH MY CLOGS & CONVERSE TENNIS SHOES. COMFORTABLE FIT AND NICE SOFT COTTON THAT HELPS KEEP MY TOES DRY. This product delivers as advertised !!! This product does exactly what it is advertised as. It is comfortable, non-constrictive, and stays in place without slipping. I will definitely buy these toe socks again. these socks toe covers are so great I live in hot climate and wear lots of m les shoes but don't want to wear socks please give them a try . I need something covering my toes when I wear shoes of any kind. These are so comfortable and easy to wear. Thankful I am able to find such a terrific sock. I like these half socks because they don't take a lot of room in your shoes or sneakers, and they keep your toes warm. Great for wearing with clog-type or backless shoes. Great for a diabetic whose toes are all ways cold! I really like this product because my feet get really hot, and it keeps my shoes clean. These are great for shoes with no heels. They are okay, but not as good as ones sold years ago. They are not made as nice in the toe area. I buy them because it is all I can find. I will buy more for family. Wear with Sketcher slides, low cut shoes, and dressy mules. Better than no-show socks. My feet would get too warm in my slides and low cut shoes, so I needed some kind of sock. These are perfect. Just what I was looking for. I was wearing the "no show" socks, but the shoes I am wearing, you could still see the socks. These are perfect! I needed a little cushion where my toes are and you can't see them with the shoes I bought them for! Great buy! Hope to use during summer sans regular socks. Half sock for whole shoe! It was quite amazing that Miles Kimball had half-socks. I couldn't find them anywhere! The cool temperatures means NO Sandals. I love wearing the half-socks with Fall and Winter shoes and boots. 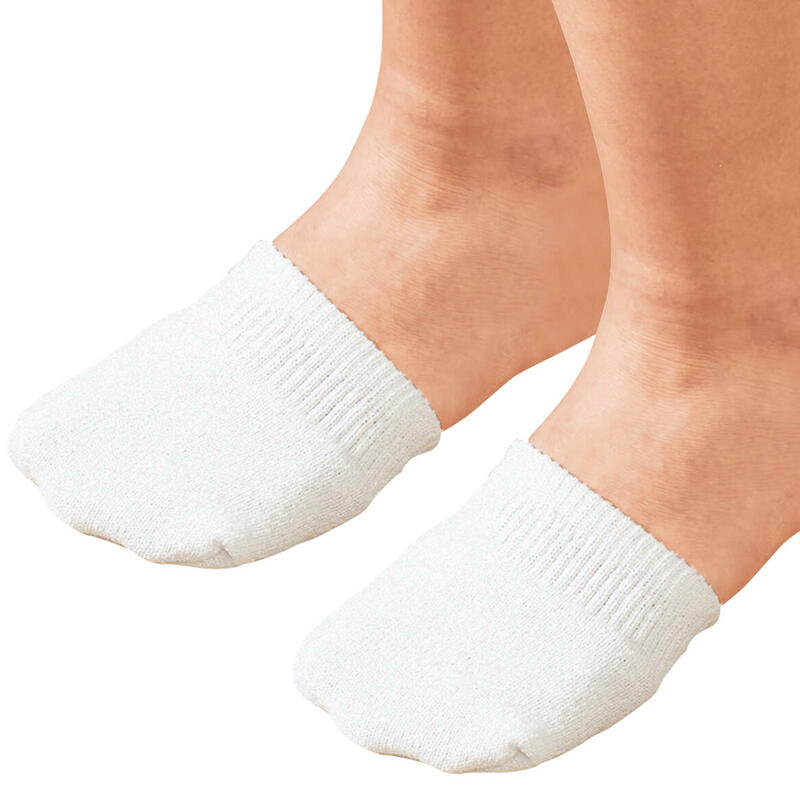 I have always ordered these and this was the first time that one half sock had a black spot, size of a nickel and it was very sticky. It was like tar of heavy ink. I tried to wash it out but it didn't work so I had to throw it out. They work for those of us with sweaty feet so that we can wear comfortable shoes in the summer. Fit better than I thought. Stay on. Great with clog type shoe. Happy to find these toe socks! Happy to find these. Nylon ones are too short and hard to put on. These fit most sizes. These do keep my toes warm around the house and particularly when I'm sleeping. I'm on blood thinners and my toes were always cold! No more!!! They are a little too tight around the tops of them. I like to wear toe socks in the summer with my canvas slip-on shoes and sneakers for the no-show feature and the cotton fabric. They keep my feet comfortable and help keep my feet from getting sweaty (and stinky when it's hot. Unfortunately the seam is right across the tip of my toes (instead of across the top of the toes). I can feel the seam with my toes and it's quite uncomfortable. I don't know if I can get used to that. Other pairs of toe socks I have don't have the seam this way. Return shipping is too much given what I paid for the socks, so I probably won't return them. I really wanted to like these socks. All the other features are great. Just the seam at the toes is bad. Perhaps MilesKimball can make a change to these toe socks, then they'd be perfect. I will watch for them next year. Nice light weight but only in White?? I want to wear these with summer shoes that have perforations but he white is too bright. Due to frostbite, I use them under thicker wool socks. Toe socks do fit high enough on foot. Quality is not best for such a price; but I can't seem to find the item any place else. These half socks were a huge disappointment. I have bought others in the past and could wear them without sitting down and clipping off threads which were left in manufacturing. They simply were not the quality I expected. I was very disappointed when I got these two pairs of EXPENSIVE cheaply made clog socks. They had strings hanging from them that I had to cut off. When I put them on, with my Burkenstock clogs, you could see the tops of them. They also shifted around on my feet when I walked. I will be returning these and searching for another product. Good have been just a bit longer. and 2 pair for the price is not a good buy should be at least 4. This product is not well made. The elastic is way too loose and the toe is cut straight across - not curved the way a sock should fit. ELASTIC IS NOT WIDE ENOUGH. HURTS ON YOUR TOE AREA. Wouldn't recommend, very rough on your feet and seams hit toes. I cannot wear these. I ordered 3 sets as I thought they would be seamless. Another pair I have are seamless. Need a style like this & want to try them. I already have a couple of pairs and use them alot in the warmer months. I wear clogs a lot and these are perfect. Not as nice as the ones they first had, but they work. The no-show footies still show so hoping half socks will work. I have been looking for half socks and you had them. However, the catalog says if you order 2 or more, the cost is $6.99, a dollar less than ordering just one pair, I did order 2 sets of the socks but I did not get the "sale" price. Is there a reason...It would be nice if I was given a credit on this order. Thank You!! TOES GET COLD AT NIGHT. To try them, I have wanted some like these. These keep your toes warm in the winter. They are great for shoes that you slip into or mules. Keeps your feet secured in shoe. I have had them before and was unable to find them anywhere else. Good for closed toed shoes with open heels (mules, clogs). They are great. They work well in clogs, and are light enough to sleep in. I just ordered two more pair one more set for me and another set for my sister. Not available for sale in area stores - only through Miles Kimball. I have a pairr, they are so comfy Forgot where I bought them, have not been able to locate them anywhere until I saw them in your book. Want to wear with athletic footwear." To keep the insole of shoes from sticking to foot! Nothing to bind at the ankle and doesn’t show in any style footwear. I had previously ordered from the printed catalogue and wanted to have more. Hope they'll keep my feet dry. 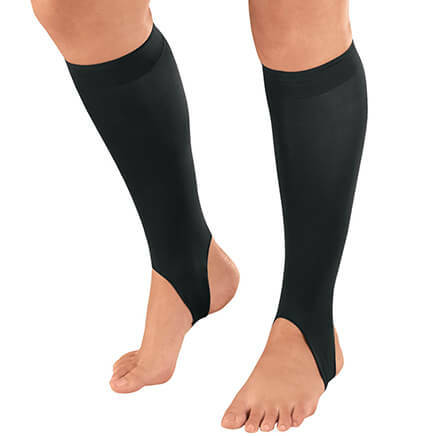 After full knee replacement surgery surgeon has me wearing thigh-high compression stockings. I had to cut the toes off the compression stockings due to a medical condition. 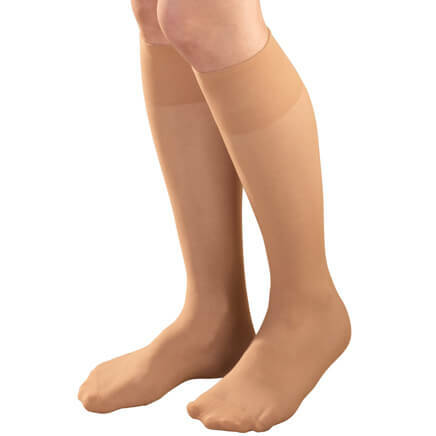 When I put Regular socks on top of the compression stockings, they then caused too much bulk in the tops of my shoes, causing me pain. I'm hoping these half socks will be just what I need so my shoes don't feel so tight. I love these for my feet to hold the thing I wear for my hammer toes! I have a pair of slip on shoes I wear in the summer that make my feet sweat. These half socks will keep my feet dry and comfortable. My feet don't sweat with these on. Love them for wearing topsiders and other loafer style shoes when you don't want to where socks. These should be helpful when I wear certain shoes. Instead of sticking to the footbed lining, my toes should be cooler and drier. I love these socks. They last a very long time! Only place I can find them and like to wear with my slides. I like that toes are covered and protected from closed toe shoes and sneakers rubbing and I don't need to fuss with those "non slip" heel covers slipping down. Nice for warm weather. Hope these half socks will be soft and comfortable & keep my feet dry. Really comfy. Love the "no socks" look, but like the comfort of the sock around my toes. only place I could find that still carry half toe socks. how do I find my order when I ordered as a guest? BEST ANSWER: Thank you for your question. Please contact us at the number below so that we may look into this matter further for you. We apologize for any inconvenience this may have caused and look forward to hearing from you.